The Trump administration issued a scientific report that found oil drilling and coal mining on federally owned lands has a significant impact on the changing climate globally. That USGS report was published the day after Thanksgiving, one of the busiest shopping days of the year when Americans typically don't follow the news. At the beginning of 2016, Obama's Interior Secretary Sally Jewell ordered the USGS, a research agency within the Interior Department, to tabulate the greenhouse gas emissions associated with the extraction and use of fossil fuels from public lands. Agency researchers looked at fuel sources across the country, from coal extraction in Wyoming and other western states to oil operations off the coasts of Texas and Louisiana in the Gulf of Mexico. The USGS also assessed emissions from the beginning to the end of the supply chain, estimating the amount of methane that seeped into the air from natural gas pipelines and from abandoned coal mines in addition to emissions that came directly from burning fossil fuels. The report separately tabulated the amount of carbon released into the air as a result of the loss of trees in federal forests because of wildfires and timber harvests. The agency also found that carbon dioxide emissions due to the extraction and use of fuels from federal lands fell 6.1 percent between 2005 and 2014. The U.S. oil and gas industry says that finding is consistent with the trend of natural gas replacing coal, a more carbon-intensive fuel, in the power sector. “That increase has played the most significant role in achieving 30-year lows in carbon dioxide emissions from power generation that we see today,” American Petroleum Institute spokesman Reid Porter said. The findings suggest the U.S. government has the potential to curb the nation's contribution to the buildup of atmosphere-warming gases by resetting public-land policy. Some environmental groups renewed calls to stop oil drilling and coal mining on public lands. “One of the first and best ways to respond is to end new fossil-fuel leasing on public lands,” said Taylor McKinnon of the Center for Biological Diversity. The Trump administration, however, has done just the opposite in an effort to turn the United States into an energy-exporting powerhouse. The president's team has pursued a policy of leasing out more federal acreage to oil and gas drillers than its predecessor, in addition to rolling back Obama-era rules meant to curb the accidental release of methane during drilling operations. 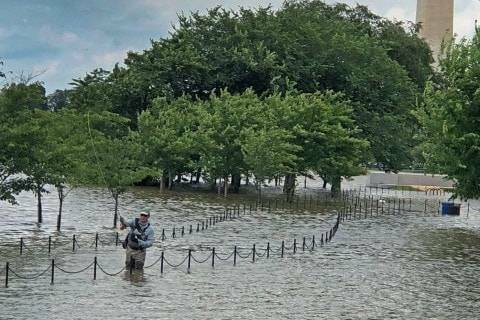 Despite receiving little fanfare from the Trump administration, the other climate report released Friday, which was the product of 13 federal agencies including USGS, was featured prominently on the popular Sunday morning programs on broadcast news networks and on the front pages of newspapers nationwide. The USGS report, by contrast, received relatively little coverage over the weekend. Still, some environmentalists are glad that a report requested during the Obama administration is seeing the light of day at all. “It's great to see the report out, period," said Chase Huntley, who leads energy and climate programs at the Wilderness Society. "This report should be a wakeup call to all Americans concerned about climate," he added. It is unclear whether Trump administration officials are paying attention to it, either. The Interior Department and USGS did not reply to requests for comment about how they might use the findings. PROGRAMMING NOTE: On Wednesday morning, Environmental Protection Agency acting administrator Andrew Wheeler and California Attorney General Xavier Becerra will sit down for interviews at The Washington Post for an Energy 202 Live event. Sign up here to receive a notification about the live stream. — “I don’t believe it”: President Trump weighed in on the major climate report his administration quietly released on Black Friday, telling reporters that he has “seen it” and “read some of it” but that “I don’t believe it." — AOC to E&C? Incoming Democratic Rep. Alexandria Ocasio-Cortez (N.Y.) is hoping for a seat on the Energy and Commerce Committee, Politico reports. The move also comes as Ocasio-Cortez has expressed support for Nancy Pelosi to become speaker, a position from which Pelosi would have a large say on who sits on House committees come January. The incoming progressive Democrat has also pushed for a “Green New Deal” proposal that would call for a 100 percent renewable energy standard. — FEMA funding: A large portion of more than $1 billion going to emergency repair costs following the devastating Hurricane Maria in Puerto Rico is going to steep markup costs contractors are charging for such repairs. “Extravagant markups, overhead and multiple levels of middlemen have helped lead to huge costs in the FEMA-financed repair program,” the New York Times reports. Heading back to Paradise, CA, today to talk with more Camp Fire victims and first responders. The context: While Zinke’s op-ed largely echoed what he told reporters while visiting the fire-scarred Golden State, he did not specifically blame “radical environmentalists” in the new op-ed, as he did in a conference call last week. Zinke had also called for active forest management policies in an op-ed for USA Today in August. — More on Zinke: The Interior Department’s internal watchdog has cleared Zinke of any wrongdoing related to allegations that the decision to shrink the boundaries of Utah’s Grand Staircase-Escalante National Monument was made in part to benefit a political ally, Republican state Rep. Mike Noel. “The report says investigators found no evidence that Zinke or other department officials knew of Noel's financial interest in the revised boundaries or gave him preferential treatment,” the Associated Press reports. — Is the most environmentally friendly option to get an artificial Christmas tree? Not necessarily. The New York Times breaks down answers to some common questions here, and points out that while artificial trees reduce environmental impact, it can also be a good option to buy a local tree, minimize the amount of driving necessary to acquire the tree and to recycle it. The changes the report describes are playing out before our eyes. — GM announces massive layoffs: General Motors announced it will cut 15 percent of its salaried workers, including 25 percent of executives, and halt production at five plants in Maryland, Michigan and Ohio as well as in Canada. “These changes are part of GM’s efforts to focus its resources on self-driving and electric vehicles, as well as more efficient trucks, crossovers and SUVs,” The Post’s Taylor Telford reports. The company will also close two unannounced plants outside North America by the end of next year. GM said it expects to save $6 billion in cash through its restructuring.